Posted by B. Daniel Blatt at 1:54 pm - December 8, 2011. In the article, there’s nary a word about the failed CEO”s Democratic affiliation nor his service as governor of the Garden State, nor any mention of his advisory role in the Obama administration. Guess in their rush to get this story out, the folks at Arianna Huffington’s eponymous Post just let these minor details slip their minds. Heh, the House panel keeps tip-toeing around his courtesy honorific; “Senator”, “Governor”, or “Mr. Corzine”. MF Global apparently (mis)appropriated $1.2-BILLLION of the clients’ private funds…and no-one dares call it “stolen”. Don Corleane was correct, you CAN steal more with a briefcase than with a gun. Lol, I loved you little rebuke. Got to keep the Huffington Post on their toes so they get it right. This is the same Jon Corzine who was quoted as VP Biden as someone who the White House consulted with for economic advice, and who the Obama Admin hinted-at as a replacement Treasury Secy. to replace Secy. Giethner? And who was too-arrogant to wear a seatbelt in own his official NJ State Police Suburban, and ran NJ for months from the hospital after a horrible wreck on the GS Parkway after his State Trooper driver lost control at over 90-mph in a 65-mph zone? ….I see a metaphor there, or an omen. The Huffington Post is taking its cues from the New York Times. If the CEO does not know where the money went, then why was Corzine the CEO in the first place? His answers are just as bad. It’s a long article and they mention the word “Democrat” once, almost at the very bottom. 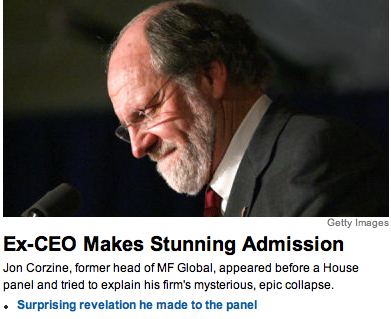 You can be certain that if Corzine were a Republican, they’d have it in the lede – perhaps even the headline – and would repeat it several times. Doesn’t matter what he intended. Under Sarbanes-Oxley, the CEO is liable for all the accounting in his company. Who would have thunk that Arrianna could neglect to remind people of the party represented by Corzine. But the Huff Post is all the news that’s fit to print, much like the New York Times. If Sarbanes-Oxley (an expansion of government that was born in left-wing demagoguery) were to send Corzine to jail, well, the irony would be kinda sweet. Not to mention the fact that Corzine was designated as Obama’s liaison to Wall Street and was regularly having secret meetings with Obama even as MF Global imploded. The reason is pretty straightforward. If this gets out widely and OWS doesn’t respond, it becomes immediately apparent to even the most dense observer that OWS is an astroturfed organization of hypocrites. If, on the other hand, OWS made a startling veer into standing on principles, the Obama Party can be torn apart by the very monsters it created. So the media lies and covers up. Huh. If Obama’s support among Wall Street bankers was dropping (and I am NOT sure of that), and if Corzine was supposed to whip it up for him… well, I wonder how Wall Street feels about Obama now. Not only has Obama proved incompetent, not only has Obama hosed the economy, not only does Obama hurt some of their feelings by bashing them… his liason has set off a nuclear bomb in their lunchboxes. The thing is, if you were a large banker, which would benefit you more — a business-friendly administration in which everyone was freed of excessive restraint and allowed to compete on an even playing field….or an ostensibly business-hostile administration in which the correct amount and targeting of donations could allow you to have regulations imposed on your competitors while ignoring them yourself? There is a reason that metro Chicago remains a corporate headquarters, despite it being a viciously hostile place towards any type of productive business: it is because the rules are waived toward those who spend the money to do it. With a simple wave of cash in the correct alderman or ward boss’s face, you can virtually guarantee that your competitors will be stymied and you will have the market or area toward yourself. From a business standpoint, a competitive landscape is quite often less risky than a government-shielded monopoly or oligopoly. True, you leave yourself vulnerable to government coercion, but when you have a group of money-grubbing imbeciles like Obama and his gang in office, it is not hard to outwit them. Watched the story of Corzine’s appearance last night on ABC’s evening newscast. He was continually referred to as, “John Corzine, former governor and senator from NJ.” I was amused at how they totally avoided the words “Democrat” or “liberal” in describing him, which seemed a shame as Corzine was always extraordinarily proud of being both. It stands to reason that if the MSM is stupid enough to keep pulling this stunt of not identifying members of both parties, then they’re also too stupid to realize why the ratings for their news programs keep plunging downward to toilet level.